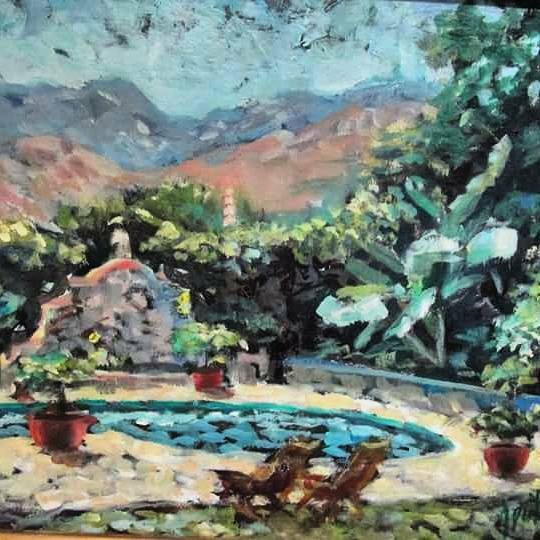 Artist Daphne Aluta moved to Ajijic with her then husband Mario Aluta in the late 1960s, and lived there for about twenty years. In September 1985, she was the first female artist to ever have her work featured in the Chapala area monthly El Ojo del Lago; all previous art profiles had highlighted male artists. Daphne Aluta. Portrait. Date unknown. Courtesy of Ricardo Santana. In Ajijic in 1974, Daphne Aluta married Colin MacDougall in a small ceremony at the home of Sherm and Adele Harris, who were then managing the Posada Ajijic. Despite this remarriage, Aluta continued to sign her artwork Daphne Aluta. 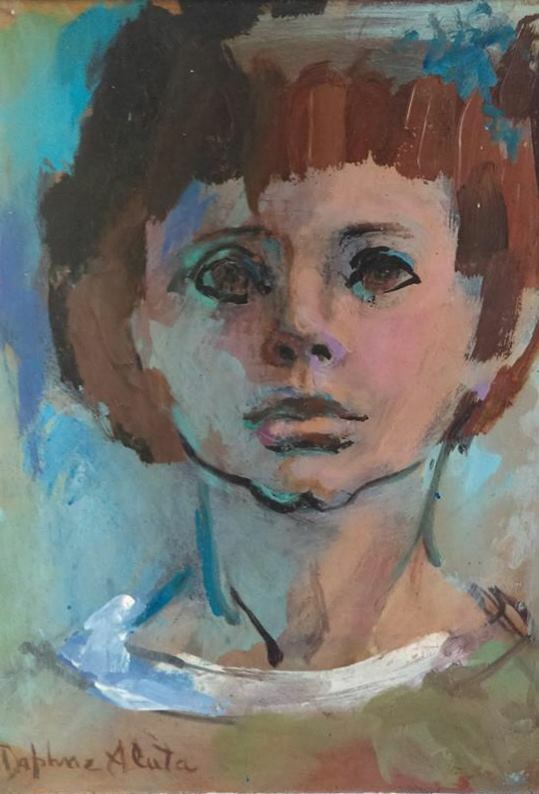 Born Daphne Greer on 24 June 1919 in Detroit, Michigan, she attended Cranbrook School for Girls and then the Cranbrook Academy of Art in Detroit. She married and moved to Santa Barbara, where the first of her four children was born. Her marriage to Turkish painter and architect Mario Aluta, who was 15 years her senior, is recorded as taking place in 1960. Daphne Aluta. Ajijic. Date unknown. Reproduced by kind permission of Ricardo Santana. During her time in Ajijic, in addition to her painting and sculpture, Aluta designed and built several homes in the village. As an artist, her group exhibitions in Mexico included the Casa de la Cultura in Guadalajara (1970); the “Fiesta de Arte” held at a private home in Ajijic (15 May 1971); the ex-Convento del Carmen in Guadalajara (1980); the Club Campestre La Hacienda (1985) on the main Guadalajara-Chapala highway; and the “Help Save Lake Chapala” exhibit in Mexico City (1988). Other artists showing in these group exhibits included Mario Aluta, Beth Avary, Peter Huf and his wife Eunice (Hunt) Huf, John Frost, Bruce Sherratt, William Hartung, Antonio Cardenas, Tom Faloon, John Frost; Lona Isoard, Michael Heinichen; John Maybra Kilpatrick; Gail Michael, Bert Miller; Robert Neathery, John Peterson, Eleanor Smart, Shaw, Hudson Rose, Agustín Velarde, Georg Rauch; Betty Warren; Gustel Foust; Laura Goeglein; Carla Manger; Jo Kreig; Donald Demerest; B.R. Kline; Eleanor Smart; Hubert Harmon; De Nyse Turner Pinkerton; Eugenia Bolduc; Emily Meeker; Jean Caragonne; Tiu Pessa; Sydney Moehlman; Xavier Pérez, Nancy Bollembach, Luisa Julian, Conrado Contreras, Rick Ledwon and Enrique Velazquez.